Australian whisky is whisky produced in Australia. As of 2012, there were 18 licensed whisky distillers in the whole country, all of them opened since 1992. Australia's largest concentration of whisky distilleries is found on the island state of Tasmania. These distilleries are better known in other parts of the world than in their own country. All of them are very small producers. As of 2014, there were nine separate whisky distilleries in Tasmania, with three more due to open by the following year. The best known distilleries in Tasmania are Lark, Sullivans Cove, Nant and Overeem. Lark, founded in 1992, is the oldest distillery in the state, and Sullivans Cove, established in 1994, is the second oldest. Most Tasmanian whisky distillers use malt obtained from one of the local brewers, either Cascade, the oldest continually operating brewer in Australia, or newer craft brewers Moo Brew. 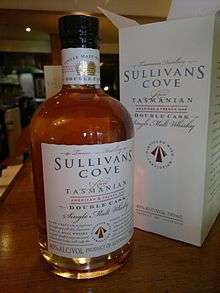 In 2014, Sullivans Cove French Oak Cask (named after Sullivans Cove) was given the World Whiskies Award for the world's best single malt whisky. It was the first time a distillery outside Scotland or Japan had won the award. Other Australian whisky distillers include the Great Southern Distilling Company, which produces Limeburners single malt in Albany, Western Australia, Wild Swan Distilling Company in Henley Brook, Western Australia, Whipper Snapper Distillery in East Perth, Western Australia, Starward in Essendon, a suburb of Melbourne, and Timboon Railway Shed Distillery in Timboon, in southwest Victoria. The following is a list of whisky distilleries in Australia. Cradle Mountain Whisky Launceston, Tasmania 1989 The first commercial whisky producer in Tasmania. Formerly known as the Darwin Distiller 1989; Franklin Distillery 1991, and The Small Concern Whisky Distillery 1994. Old Young's Distillery Henley Brook, Western Australia 2006 Formerly known as the Wild Swan Distilling Company. 1 2 3 4 McGoram, Simon (13 July 2012). "The Australian Whisky Trail". The Sydney Morning Herald. Retrieved 22 May 2014. 1 2 Colquhoun, Steve (21 March 2014). "Tassie whisky named world's best single malt". The Sydney Morning Herald. Retrieved 23 March 2014. ↑ Quigley, JT (3 April 2014). "The World's Best Single Malt Scotch Is…Tasmanian?". The Diplomat. Retrieved 21 May 2014. ↑ Morgans, Julian (20 May 2014). "An Island You've Never Heard of Is Making the Best Whiskey You've Never Tasted". Munchies. Vice Food LLC. Retrieved 21 May 2014. ↑ Hiscock, Geoff (10 March 2014). "Apple Isle's whisky makes a splash internationally". The Australian. Retrieved 22 May 2014. ↑ Courtney, Pip (8 July 2013). "Tasmanian whisky given high praise by critic Jim Murray". ABC News. Retrieved 21 May 2014. ↑ Boothroyd, Aiofe (17 October 2013). "Working with whisky: Q&A with Sullivans Cove". Hospitality Magazine (Australia). Retrieved 21 May 2014. ↑ Frost, Vicky (2 April 2014). "Tasmania's latest export: the best whisky in the world". The Guardian. Retrieved 21 May 2014. ↑ McLaughlin, Martyn; Smith, Claire (30 March 2014). "Best whisky in the world award goes to ...Tasmania". The Scotsman. Retrieved 21 May 2014. ↑ Roskrow, Dominic (February 2013). "Limeburners whisky". World Whisky Review. Connosr Ltd. Retrieved 23 March 2014. ↑ Crossley, Lee (23 September 2014). "Australian whisky takes on the world". Good Food. Fairfax Media. Retrieved 25 September 2014. Wikimedia Commons has media related to Whisky from Australia.